It’s important to highlight and put emphasis on your main qualifications and work experience at the time of making your resume. Detail the activities you have completed in chronological order. Mention what programs you use and your skill level. Place key titles that describe the position that you occupied (many recruiters read the title before looking at the task completed) and use another color to highlight them. Remember, recruiters receive thousands of resumes and will only take a few minutes to read yours. For this reason, the information must be structured and relevant to the job to which you are applying. Be sure to adapt your resume for each job offer or, create different versions of your CV that respond to the position to which you are applying, without lying. This way you will have a better chance of catching a recruiter’s attention. While editing your resume, focus on your greatest skills, qualifications and experience that correspond to the job for which you are applying. This will help you achieve that vital step toward getting the initial key interview. Include all the information you consider important. The more relevant information you present, the more likely you will have the opportunity to obtain the job you want. 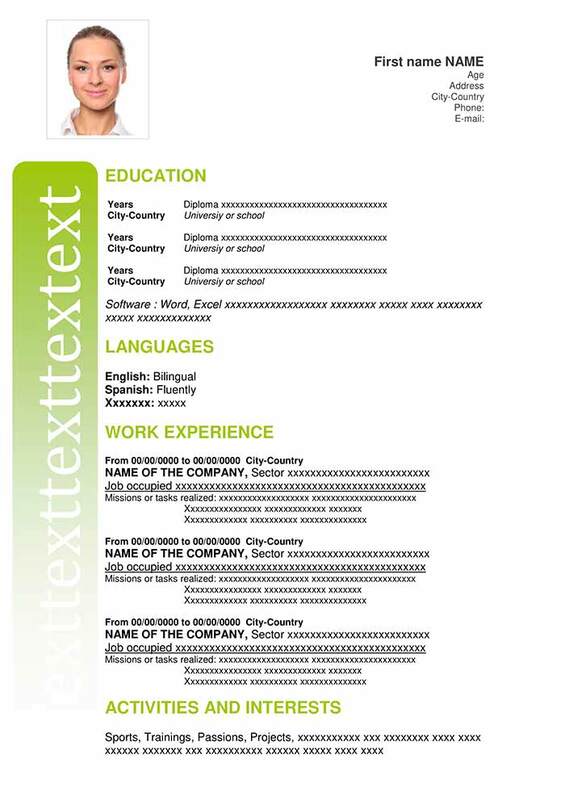 To begin, you can download one of our CV samples found on our website and personalize it as you like. 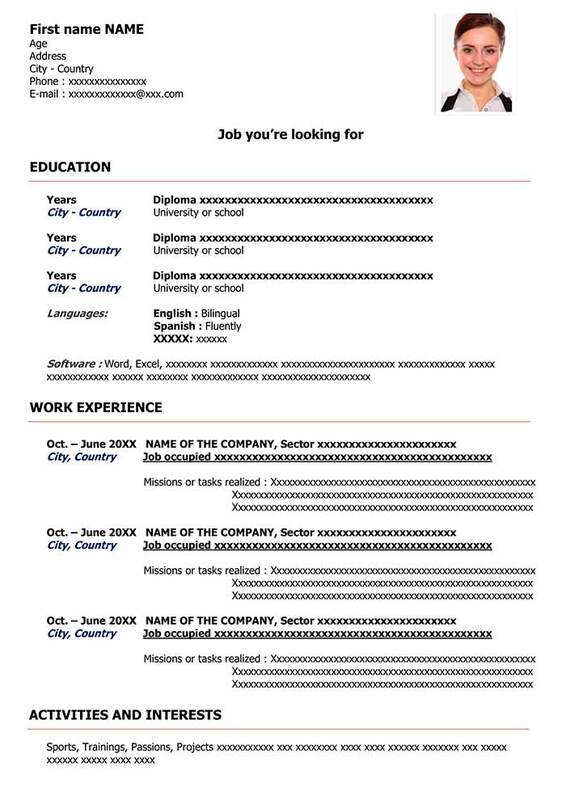 On a world wide scale, ideally a resume should be written as one page. However, in some cases, a 2 page resume is acceptable if you have a lot of professional experience in the position for which you are applying. If you are a student or young adult with 5-6 years of experience, then a one page resume is appropriate for you. That way you will avoid overwhelming the recruiter with too much information. It will also help you to concentrate on the details that really make your profile stand out. It is crucial to include key points within your CV and save the details for your first interview. Thanks to this category, the recruiting agent will have a better idea of the skills and knowledge that you have and that have contributed to your major accomplishments allowing you to achieve your work goals. These achievements should be concise while saving the details for the interview. Describe the tasks and accomplishments that are relevant and essential for the position you are applying and wish to occupy. You can lie on a resume, but sooner or later it will become apparent what you really know or don’t know when it comes time to put it into practice. Keep in mind that everything mentioned in your resume can be an object of question for a recruiter. Avoid lying! You can embellish some of the information in the CV, but don’t exaggerate. That’s the best tip to write a good resume. Attach a link to your personal blog or a QR code to your video or portfolio. These can be decisive factors at the time of selecting a candidate. Don’t hesitate to make the best use of your resume by attaching everything you think is necessary, as long as the content is focused and easy to read. For this purpose, every one of our curriculum vitae templates contains the necessary categories, properly organized and with what’s most important to a recruiter. Don’t be afraid to show your resume to various people (friends, relatives, family…) to receive constructive criticism. This will help make your resume better before sending. Indicating your language levels (Spanish, English), computer skill levels (Word, Excel, Photoshop…), etc., will allow the recruiter to have a more concrete vision of your abilities and skill levels. These elements can make a difference with respect to other candidates that are applying for the same job as you. Many forget this seemingly obvious point. Indicate your email address, phone number, Skype, LinkedIn… and any other information that a recruiter can use to contact you about the selection process. Write a resume that can be exported in Word or PDF format. This is very important, since these formats are the most used and demanded by recruiters. Not having them in these formats will prevent you from applying for certain job offers. 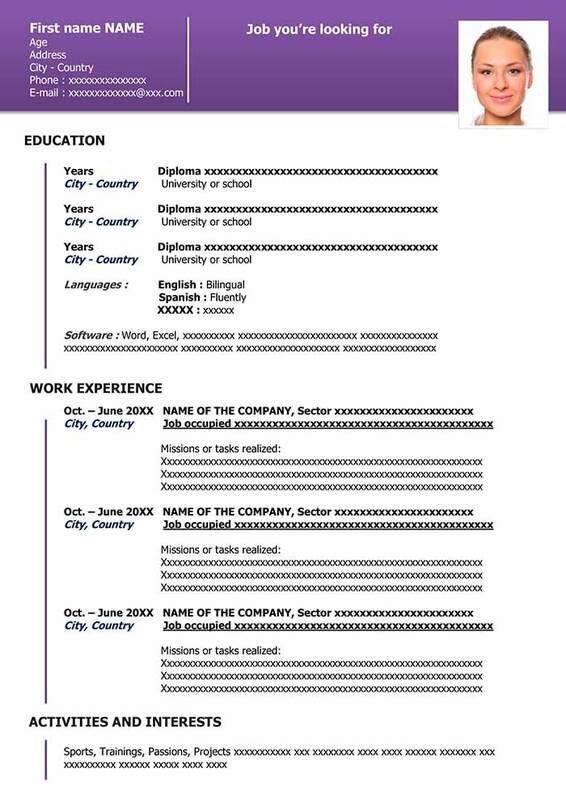 At the same time, it is important to translate your CV, above all into English, especially since many companies use it. This will demonstrate your mastery of the language and your capacity to adapt to the position. These are our top 10 tips for creating the perfect resume. 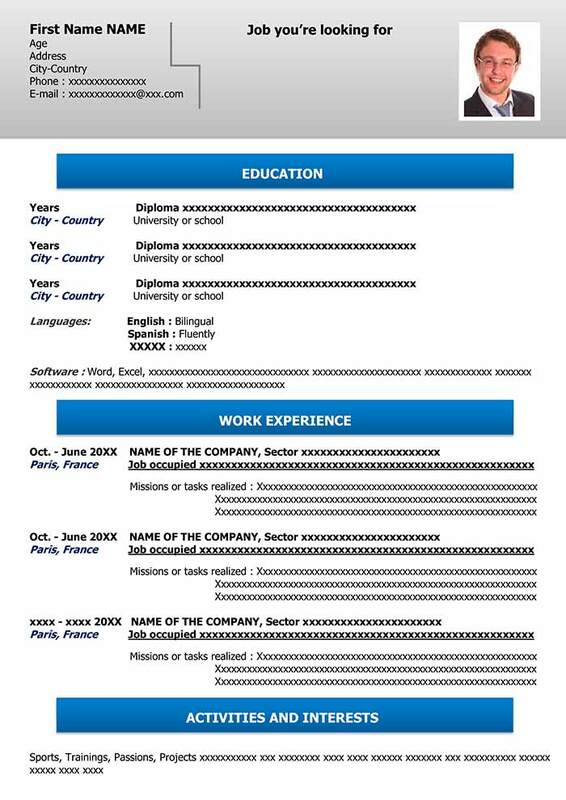 Discover our free downloadable resume models in Word format! My-resume-templates.com - Example resumes and templates to download for free in Word format. All our CV templates are free to view and download. All our resume are compatible with Microsoft Word. Enjoyed our resume templates? Don’t forget to like and share! Resume in Word or in PDF Format? The content of this website may not be used on other websites and must not be copied without our permission, subject to copyright regulations. The content of this website is protected by copyright. All the resume templates made available by My-resume-templates.com are offered with no guarantee. Use of these resume templates is your own responsibility. The available templates are offered “as is” and without guarantee.